Often compared to San Francisco and Naples, the sprawling eastern city of Vladivostok serves as the largest Russian port on the Pacific Ocean. Visit Tokarevskiy mayak and St. Nicholas Cathedral for their historical value. Get outdoors at Astafyev's Bay and Golden Horn Bay. Next up on the itinerary: explore the galleries of S-56 Submarine Museum, appreciate the history behind Monument to Eleanor Prey, snap pictures at Bridge to Russky Island, and don't miss a visit to Golden Bridge. For ratings, maps, where to stay, and tourist information, use the Vladivostok trip itinerery planner. If you are flying in from Australia, the closest major airport is Vladivostok International Airport. In October, daily temperatures in Vladivostok can reach 17°C, while at night they dip to 1°C. Wrap up your sightseeing by early afternoon on the 4th (Tue) to allow time for travel to Irkutsk. 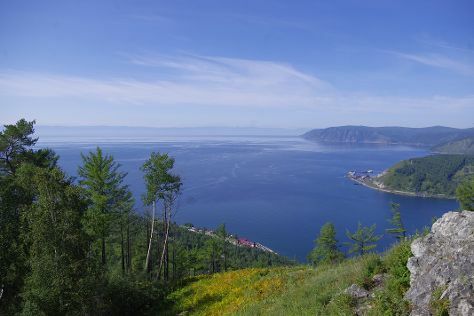 Escape the urban bustle at Lake Baikal and Pribaikalskiy National Park. Your inner history buff will appreciate Church of the Sign and Cathedral of the Kazan Icon of the Mother of God. Step out of Irkutsk to go to Angarsk and see Clock Museum, which is approximately 52 minutes away. The adventure continues: take in the architecture and atmosphere at Church of the Savior of the Holy Face, see the interesting displays at Sidorov State Mineralogical Museum, get engrossed in the history at Irkutsk Regional Memorial Decembrists Museum, Volkonsky House, and view the masterpieces at Dias Art Gallery. For more things to do, photos, where to stay, and other tourist information, read our Irkutsk vacation builder. You can do a combination of taxi and flight from Vladivostok to Irkutsk in 5.5 hours. Other options are to drive; or do a combination of taxi and train. The time zone difference when traveling from Vladivostok to Irkutsk is minus 2 hours. Traveling from Vladivostok in October, expect Irkutsk to be little chillier, temps between 7°C and -5°C.